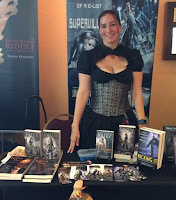 ConCarolians is this weekend and I will be there with books, swag, and hopefully something intelligent to say on panels! If you are in the area, please stop by and say hello. This will be my first public appearance in several years, and I'm insanely shy, so if I'm a little quiet, please know I'm absolutely thrilled to see/speak with you, my tongue just gets a little tied! 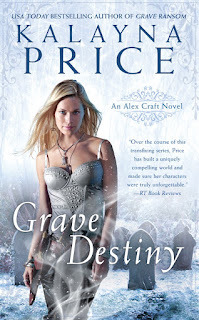 The completed draft of GRAVE DESTINY (Alex Craft book six) is in the hands of my editor. It still has to go through a lot of steps before it reaches you, including revisions, line edits, copy edits, and page proofs, but the biggest part of the process is now done and the book is more or less the story you will eventually read. Yay! I don’t have an exact release date yet (and I’m not sure if UK and Audio will be behind US print again, but I’ll try to find out before release this time) but from what I understand the plan is for it to come out in Spring of 2019. What I do have for you today is the cover! Guys, I LOVE this cover. I hope you do too! I’ll update with more information as soon as I can! In the mean time, feel free to leave a comment and let me know what you think of the cover! GRAVE DANCE Contest and extended excerpt! Today all my news is about Grave Dance. You might have seen my earlier tweet that I received a couple of ARCs. I think now is a good time to give one of those copies away, don't you? What is up for grabs: An ARC (advanced reading copy) of Grave Dance. These are pre-pageproof copies, so there are some uncorrected mistakes and a few very minor text changes. How to win: Leave a comment telling me how you first found me and my books. I'm just curios. ^_^ Only comments left on the blogspot blog will count toward entry, so if you are reading this post somewhere else, please stop by THE BLOG. When to win: The contest will close April 30th at 11:59pm EST, so be sure to get your entry in before then. Who is eligible to win: I'm willing to ship overseas, so the contest is open internationally. Anyone who has not already read or received a copy of Grave Dance, and who is not related to me or my critique partners is eligible to win! Is there an author in the house? Some of you likely recall my post "where did the author go?" from several years ago. This post is basically a follow up to that, as well as a look toward the horizon. This weekend, I made my first public appearance since about 2012. I was nervous for many reasons, not the least of which was my long hiatus. Thankfully, it went really well. ConCarolinas, while not the biggest convention, has always been a favorite because of all the great friends who attend it. Thank you everyone who stopped by the table to say hi, who attended panels, and who chatted at the bar and/or breakfast. All of you made this a wonderful first con back, and I am encouraged to expand my schedule further in the future!